Today, what we’re gonna be doing is a little product review and demo, this is the SoyaJoy G4 soy milk maker. My primary reason for getting this SoyaJoy G4 is to make soy milk. In terms of what you get when you open the box, you get the SoyaJoy G4 device. This device holds about 1.7 liters of liquid. You’ll notice that the inside is all stainless steel, it also has a little stainless top as well as a blade. The blade is what’ll be pureeing the beans or whatever it is that you’re gonna be putting in here. I was actually pleasantly surprised when I first used it, it does a pretty good job of making soy milk. It eliminates a couple of steps from the soy milk making process. So if you’re all about convenience, efficiency, this might be something worth considering. Isn’t that what kitchen tools are for? If you unbox it, it comes with a manual, a strainer, a scrubbing pad, a half pound of soybeans, a plastic pitcher, and power cord. On the top there’s five buttons, and these are all the different foods the Soyajoy can make beans, grains, soups, juice and porridge. 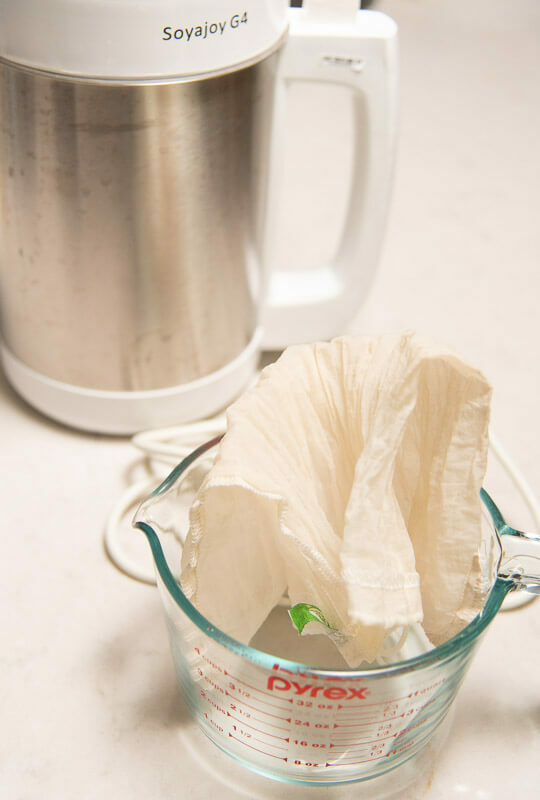 I actually don’t use the strainer or the pitcher, as I prefer to use my own nut milk bag, and Pyrex. I also don’t use the other functions, so can’t speak to the efficacy for those foods. But using this Soyajoy for soy milk is quite simple. All you need to do is add the beans and water and press a button. About 20 minutes later your soy milk will be done! 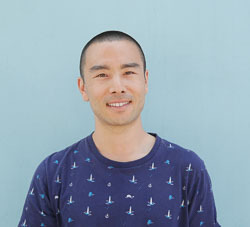 The Soyajoy does the cooking and it purees everything. 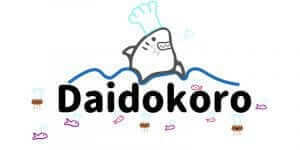 Okara can be used for anything from baked goods to savory vegetable appetizers. So don’t throw it out! if you don’t have an immediate use, it freezes well. Hambagu, a Japanese-style hamburger, is one of my favorites. And of course, we’ll also have our soy milk. The soy milk made by this device can be used for any dish soy milk is used for, like ice cream, hot pot, and of course tofu, yuba (tofu skins)! Overall, the device seems pretty well made and though I haven’t had it too long, I’ve been pretty satisfied with it. I also deskin my soy beans. In my experience, the taste is somewhat subtle if you leave the soybean skin on versus take it off. I think, depending on what you’re gonna be using it for, if it’s gonna be for drinks like smoothies and so on, you might not notice. But if you’re making something like tofu, or you’re gonna be drinking the soy milk by itself, you might notice the difference in flavor. It does take a little bit more effort to de-skin the soybeans, so it might be worth experimenting yourself to see if that’s something that you actually think matters to you. To save time I make a soak, deskin then freeze a few cups worth. I freeze the beans in bags. That way I don’t have to do it all over, one cup by one cup, so it helps me save time. If you don’t batch your cooking like this you might want to consider starting to save time! You can drink the soy milk right away if you want, once it’s a little bit cooler. You can add some sweetener if you want, some cinnamon, if you want a spice, or vanilla extract, for example, if you want a vanilla flavor. Like I mentioned above, you don’t wanna waste the okara! it has a lot of nutrients and fiber in it, so there’s nutritional value there. If you’re super lucky, you might be able to find it at a tofu shop, but I haven’t really seen it sold in Los Angeles/Orange County area where I live. For the Soyajoy, make sure both top and bottom metal parts are rinsed right away. Otherwise, the soymilk and bits are gonna get stuck to it. This, you don’t want! It’s gonna be more difficult to clean, so I usually just rinse it right away. I’d say one pro is that it takes out a couple steps from the stove process. then you’ll puree them in your blender, like a VitaMix, for example. 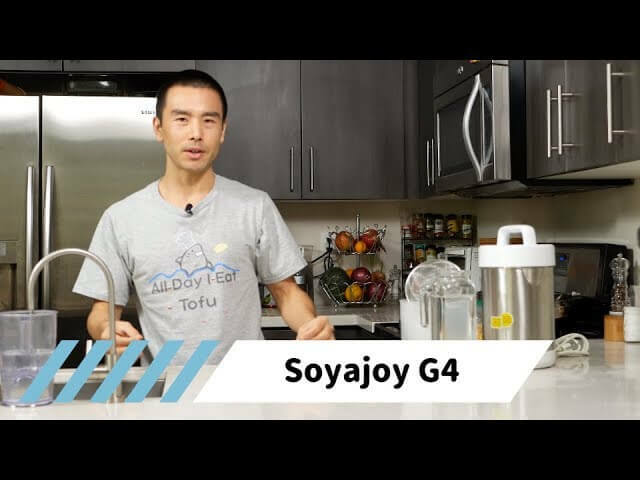 So what the Soyajoy G4 does is take out steps 2-4! So there’s a little bit less transfer required, and, in my opinion, it’s totally worth the time savings there. When you do it on the stove, if you’re not careful, your soy milk might boil over and make a mess! And if that happens, it’s really hard to clean, so it takes out that step! Another pro is it’s made of stainless steel, which I like. I guess some of the cons, it’s definitely a specialized appliance. So, if you already have a blender, it may not necessarily be the best addition to your kitchen. It basically is the same thing, it just has a heating component to it. Another con would be that the capacity is somewhat limited. So like I mentioned before, it only does about 1700 mils max, so you can only do just about a cup, no more than really a cup of soybeans before you’re at capacity, otherwise it might spill over, which you don’t want. The stuff that it came with, I don’t know if it’s really the highest quality, so I don’t use it. Also, one thing I’ve noticed is that compared to my Vitamix /stove soymilk, the okara is a yellow color, as opposed to white. This may be due to the Vitamix doing a better job pureeing the soy beans which allows for a better extraction. But flavorwise, it’s not obvious and I can’t tell a difference. But still something worth mentioning. I think that’s another valid con there, but other than that I can’t think of anything else. All you have to do is actually add in the soybeans, the soaked soybeans, some water, all you do is push a button, and 20 minutes later, you’ll have soymilk! 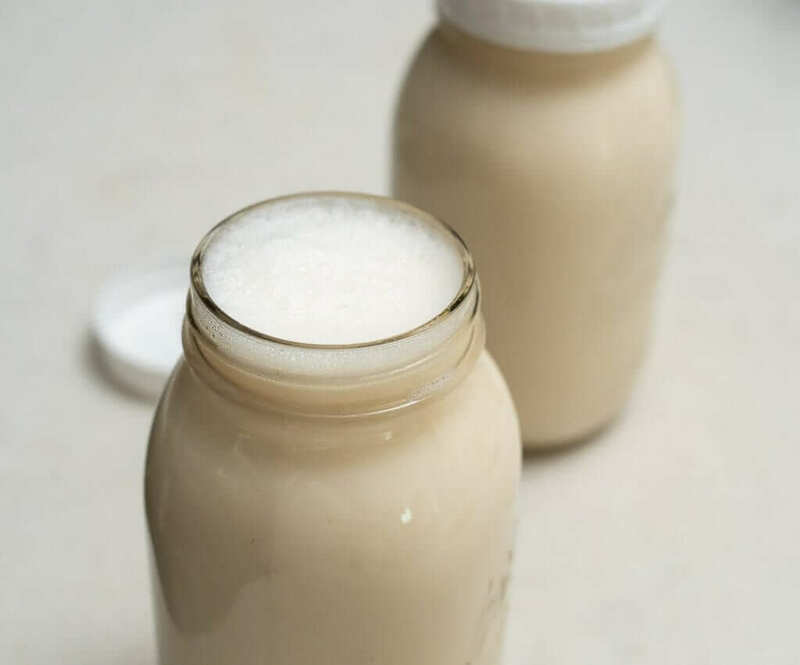 There’s nothing like homemade soy milk. 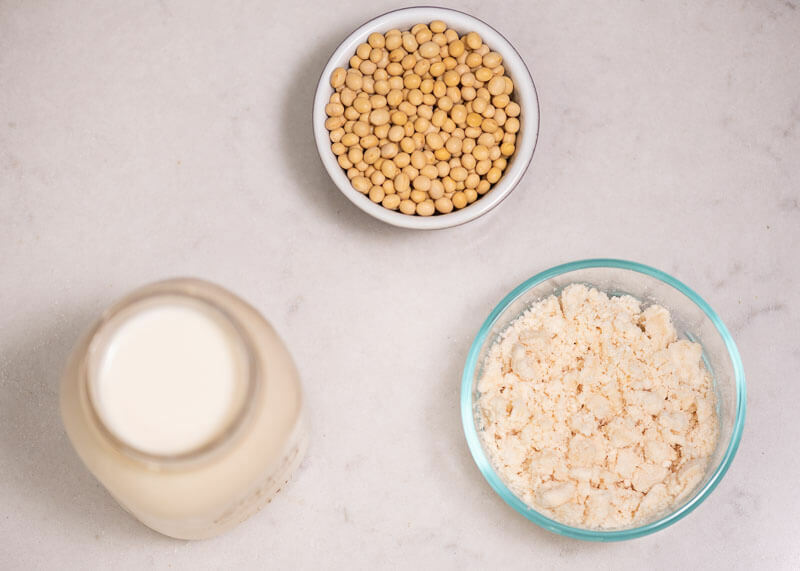 As you may know, freshly made soy milk is slightly sweet, very delicate and refined in flavor and full of nutrients. The only downside is because it has no preservatives, you’ve gotta eat or drink it with in a few days or it may spoil. But usually this isn’t a problem, since it’s so good it may not last very long in your fridge! 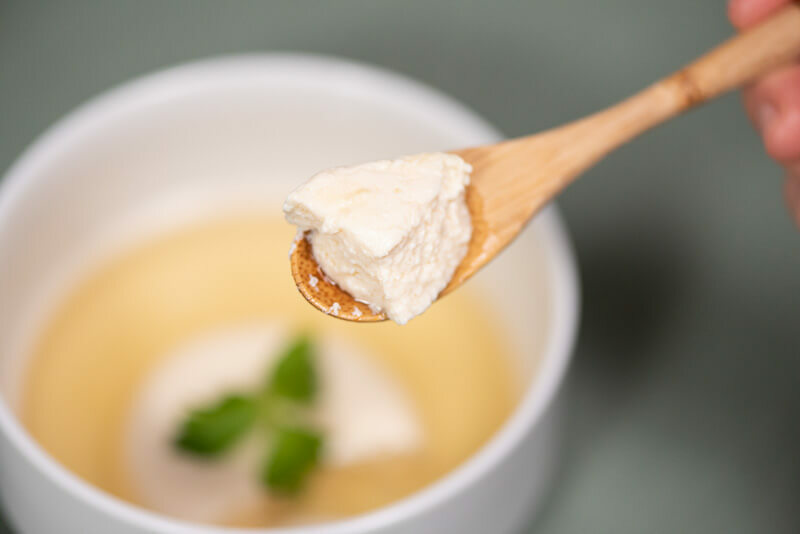 And now that you can make home made soy milk, you can also make home made tofu, yuba and other tasty dishes (like the Japanese style kinugoshi tofu osuimono below)! I make a soy milk, tofu and other Japanese soy dishes on a regular basis so i thought I’d give it a try. It definitely saves some time. 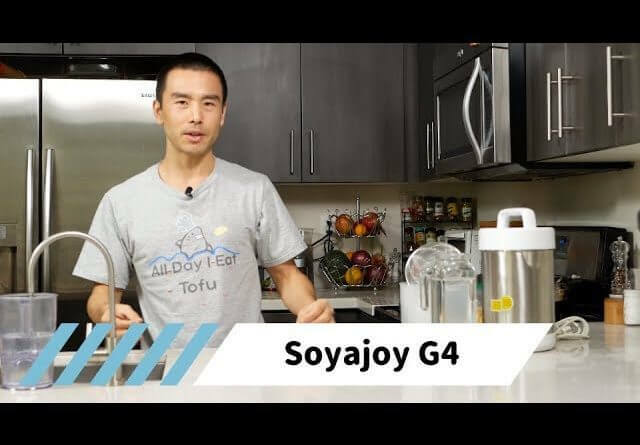 If you know you’ll be making soy milk or other types of nut milk or pureed soups on a regular basis, this the Soyajoy G4 might be worth looking into. There are some other soy milk maker brands available, but this one seemed to have the best reviews so that’s why I chose it. Though I’ve only had it a few months, I’ve used it enough that i’m happy with the soy milk it produces. Is this soy milk maker something you think you’ll be adding to your kitchen? lmk in the comments! My sister-in-law makes her soymilk in a Vitamix and it turns out well. i do too, not as much as i used to though since i got this 🙂 how does she use the soy milk? 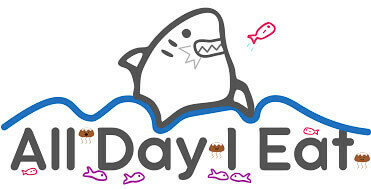 nice, i enjoyed eating that when i went to taipei last year 🙂 do they make the donuts too?